When friends and family get together, nothing can beat spending hours relaxing and interacting in a beautifully-finished game room. And Weaver Furniture Sales offers a wide selection of game room furniture. 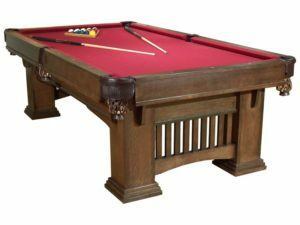 So check out our impressive collection of pool tables, cue racks and ball racks. Ready for a game of cards? 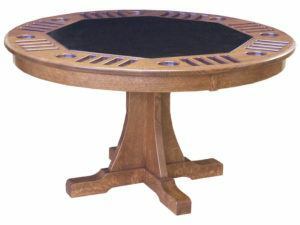 We have several poker tables to choose from. Also chairs to go with them. In addition, you can choose from various board games like checkers and chess. 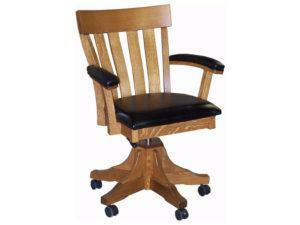 So browse out online selection of custom game room furniture. Or visit our ‘brick and mortar’ store in Shipshewana, Indiana. Because we designed Amish game room furniture to make you a winner! Richly finished wood slats accent 8′ Mission Pool Table. 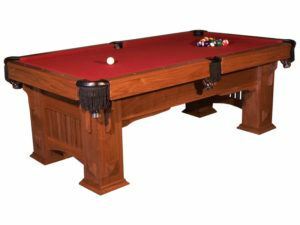 Contact Weaver Furniture Sales to customize this Mission Slat Pool Table. 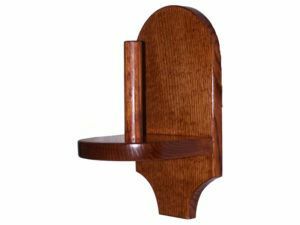 CUSTOM OPTIONS Wood Stain Wood Species Choice Cloth Options Pocket Choices Visit our Shipshewana Furniture Store and check out our huge array of Amish game room furniture! 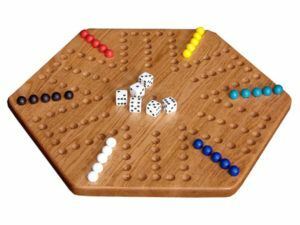 Aggravation Game The Aggravation Game makes a great gift for any game fan. Contact Weaver Furniture Sales with any questions that you have about this home accessory. Visit our home store in Shipshewana, IN to see more wood furnishings. 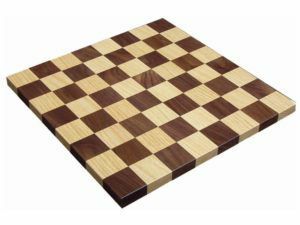 Checker Board The Checker and Chess Set makes a great gift for any game fan. Contact Weaver Furniture Sales with any questions that you have about this home accessory. Visit our home store in Shipshewana, IN to see more wood furnishings. Checkers The handcrafted Checkers make a great addition for any game fan. Contact Weaver Furniture Sales with any questions that you have about this home accessory. Visit our home store in Shipshewana, IN to see more wood furnishings. 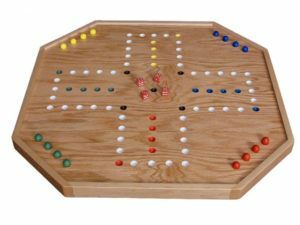 Large Aggravation Game The Large Aggravation Game makes a great gift for any game fan. Contact Weaver Furniture Sales with any questions that you have about this home accessory. Visit our home store in Shipshewana, IN to see more wood furnishings. 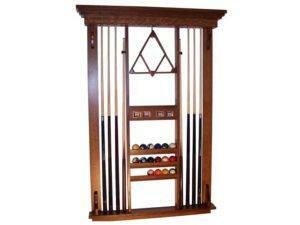 The Pool Cue Rack is a great addition to any billiard room. Please Contact Weaver Furniture Sales with any questions that you have about this Wooden Home Furnishing. Visit our Shipshewana Furniture Store to see more Wooden Home Furnishings. 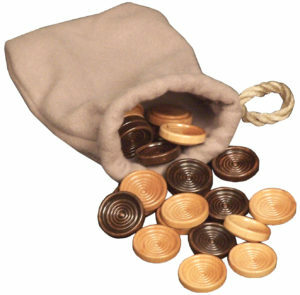 Small Aggravation Game The Small Aggravation Game makes a great gift for any game fan. Contact Weaver Furniture Sales with any questions that you have about this home accessory. Visit our home store in Shipshewana, IN to see more wood furnishings. 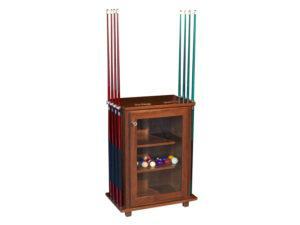 The Talc Powder Holder holds standard talc powder and helps complete the perfect pool hall set-up in your game room. CUSTOM OPTIONS Wood Stain Wood Species Choice Visit our Shipshewana Furniture Store and check out our huge array of Amish game room furniture! 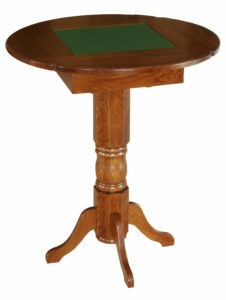 The Ultimate Game Pub Table is ready for your home. This table will provide endless hours of entertainment for friends and family. 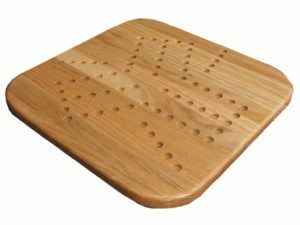 Please Contact Weaver Furniture Salesfor more information about this game. Visit our Shipshewana Furniture Store to see more Home Accessories. 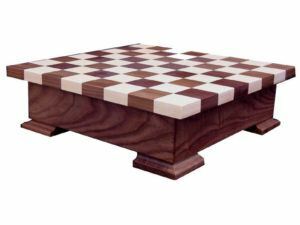 A sturdy design marks the Ultimate Game Table with Pieces. 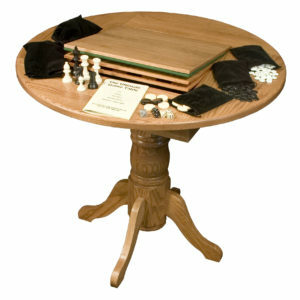 Contact Weaver Furniture Sales with any questions that you have about this Solid Wood Game Table. Visit our Shipshewana Furniture Store. 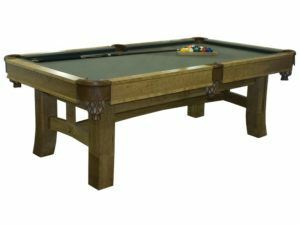 View our huge variety of wooden game room furniture. 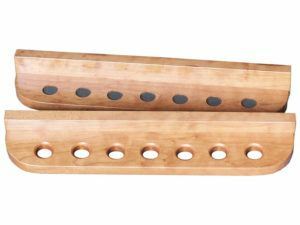 The Wall Mounted Cue Rack accommodates 8, 10, or 12 cues and offers the perfect storage solution for your pool cues. CUSTOM OPTIONS Wood Stain Wood Species Choice Visit our Shipshewana Furniture Store and check out our huge array of Amish game room furniture! Walnut-Maple Checker Box The Walnut-Maple Checker Box makes a great gift for any game fan. Contact Weaver Furniture Sales with any questions that you have about this home accessory. Visit our home store in Shipshewana, IN to see more wood furnishings. Sturdy construction and dynamic space highlights the Wood Folding Chair. 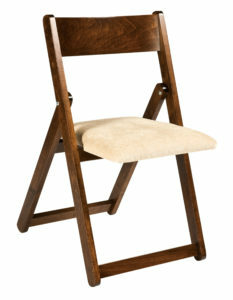 Contact Weaver Furniture Sales to customize this Amish Folding Chair. Visit our Shipshewana Furniture Store. Also review our wide selection of custom dining room tables. 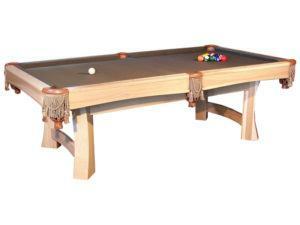 Game room furnishings can take a beating as your family members and friends around them have fun winning. At Weaver Furniture Sales, we know this. So that’s why we depend on Amish artisans to painstakingly build each item of furniture. Also, the Amish builders use solid hardwoods and traditional techniques. (Which means no bargain materials or cookie-cutter-style construction). The result? 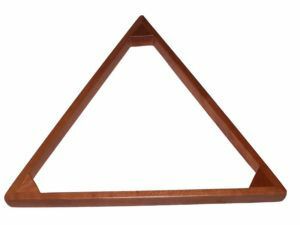 Every Amish pool table, Amish poker table, checkers and chess game you order should, with proper care, keep the party going for years to come.